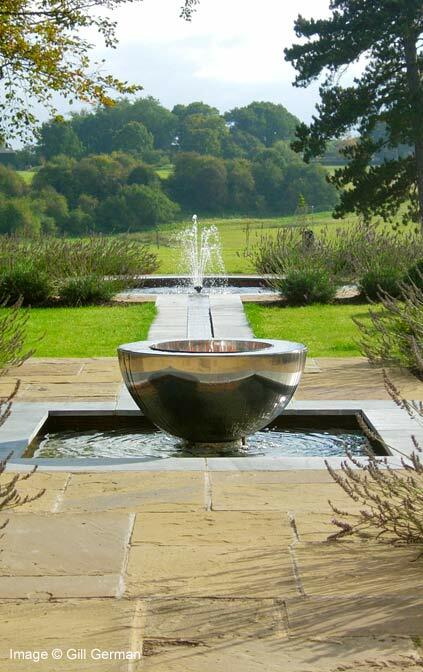 Water features have become an inherent part of modern garden design. 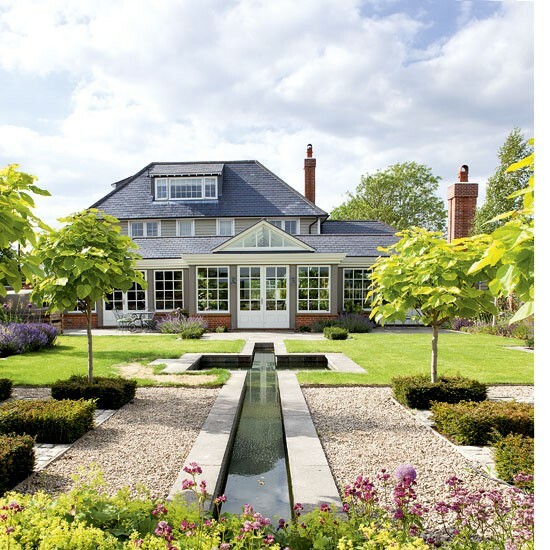 Whether it is a large cascading waterfall and inter-connecting pools or bubbling water emerging from a granite boulder we enjoy the sight, sounds and life that water brings to the garden. 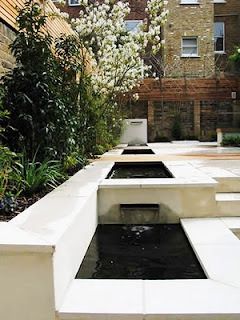 We tend to think of ponds or fountains as being our only options yet there is another type of water feature which has been in use since Egyptian times – a rill. In landscape design terms a rill is a narrow channel of water which moves in a straight line through the garden. Typically very shallow they are ideal for homes with small children where safety is a prime consideration and can be incorporated into even small gardens or courtyards by building them directly into the patio itself. Rills can be constructed above ground rather like a narrow raised border or set at floor level thus offering great versatility. Although primarily constructed for decorative purposes, rills can also bring additional functionality to a garden. I am currently working on a patio design which calls for a raised border to wrap around three sides, providing a sense of enclosure yet still allowing an open view of the garden. I have planned these borders to be 17” high and edged with wide stone slabs to provide additional seating as needed. The same principle can be applied to a raised rill. In a small garden this water channel need only be 6” wide and perhaps just offer a 12” deep seat on one side. Yet this small feature will provide sound, movement and seating – truly multi-functional. For a unique garden experience what about adding custom seating which bridges the rill itself? Benches or chairs could be set over raised rills, perhaps backing up to a wall or hedge in such a way that water flows under the seats. Fun! Defining areas of the garden for distinct purposes such as eating and dining can be achieved by the placement of furniture or containers, a change in elevation or by the addition of an ‘entrance’ such as an archway. A rill can serve the same purpose. If raised the distinction between outdoor rooms is more obvious, if set at ground level the moving water is less intrusive on the landscape yet still delineates the space in the same way that an area rug clearly defines the seating area within a living room. while focusing attention on the French doors of the home. When designing gardens we employ various ‘tricks’ to move the eye around the space – color and plant repetition or strategically placed focal points for example. The strong architectural line of a rill is a very effective way to draw the eye down a long axis to a distant feature such as a sculpture. These two elements are interconnected. The strong geometric profile and crisp lines of a rill lend themselves to minimalistic, contemporary design especially when constructed with materials such as stainless steel or black dyed concrete. More traditional, formal styling would suggest the use of tile, brick or stone. 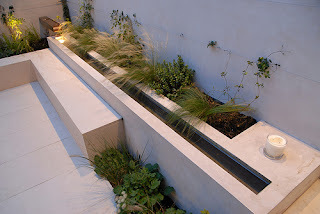 Restraint is key to successful rill design regardless of style. Having selected materials the next consideration will be of the design itself. How will water enter and leave the rill? Will there be features such as small pools or sculpture placed along its course? Is there a slope which needs to be accommodated? 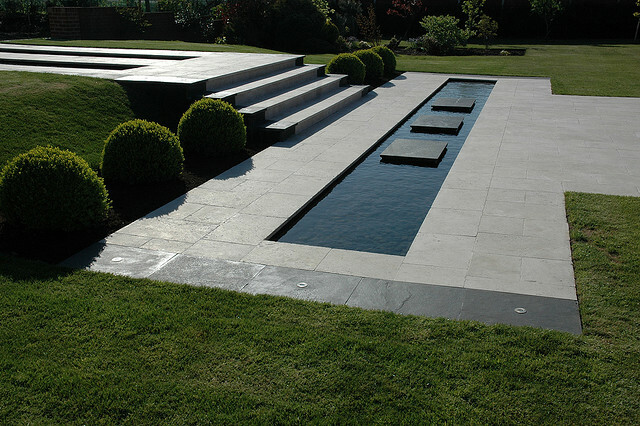 this elegant rill as well as an interesting design feature. form while creating s softer look to this courtyard. By design rills are intended to be tranquil with a barely perceptible movement of water. Hidden reservoirs often allow for gentle re-circulation of the water and several examples can be seen in these photographs. However, many designers feel that a rill looks it’s best when the water ‘disappears’ into a small shallow pool, in which case I would recommend its shape be square to maintain the geometric lines. One could even place a series of small square pools along the course of a long rill to create an interesting rhythm without compromising the design intent. walls of this rill to accommodate a slope. A series of rills, set at angles or in one continuous run can be stair-stepped down a modest slope, each length separated by short drops. These look wonderful when each step is of equal depth. A garden becomes a magical place at night when water features are illuminated. Always consider lighting at the same time as planning any landscape renovation as it is much easier to run cables while construction is in progress than after hardscape has been installed. Under water lights are effective if you can keep the water clean (murky water rather ruins the effect! ), while perimeter lighting set flush into the surround will highlight the feature without interfering visually. Rills are not usually planted since the calming qualities of the water will be disrupted and the shallow channels limit plant selection anyhow. If planting is important to your design it would be better to add planting adjacent to the rill. This decision will have an impact on the overall style, however. Left unadorned the still water can reflect the sky giving a sense of openness. Adjacent grasses, shrubs and perennials will help anchor the feature into the garden and create a cozier feel but the design may lose its contemporary edge. So think beyond what the nurseries and garden centers have to offer and consider designing something truly unique. Dare to be different! 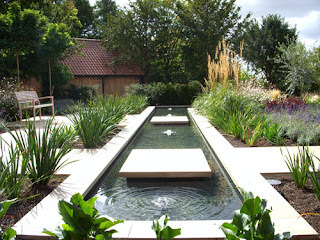 I agree that water features have become an inherent part of modern garden design. Essential even, to an extent. I think the Rill is still underused but it's coming up alot more in recent garden projects. Superb article and so many inspirational pools there! I was surprised at how few examples I could find by American designers. As you say the rills are underused yet offer such versatility. Beautiful. Just beautiful. I never knew what this water feature was called until I read your post, but I was familiar with them after touring the Alhambra in Spain, where this feature was used. It's a great way to add water and movement in a style that is clean and modern -- and to think the Moors used this style so long ago. I have heard wonderful things about the rills in Spain but sadly have never had the opportunity to see them myself. I have seen these before; it's a great idea. Your informative post is inspirational. I think a rill on one side of my patio would be fabulous; another dream! I know what you mean! I'm trying to work out how to add one here without also creating a haven for mosquitoes which can be a problem in this area during the summer. Although not exactly dry in the fall and winter, Seattle is a northern extension of a Mediterranean climate in the summer and as such, I've seen numerous examples of rills here, usually done by informed homeowners. A fabulous one also is to found at the Shaw garden of Missouri Botanic Gardens in St. Louis. Walt, where are you in Seattle? I live in Duvall and have only seen the one at the Bellevue Botanical Gardens designed by Pat Roome. 'Pure' is a great way to describe it - simplicity in design should be just that. We looked at these extensively in my history of landscape design course. You don't see them around much, but I think there is one at Chanticleer in kind of an obscure location. I will have to photograph it. Carolyn, I'd love to see any photos you have. Hi Karen, Our home is traditional and so I have designed the garden to be in keeping with it. There is a part of me however that loves contemporary design and artwork. Clean lined and spare, rills appeal to that part of me. I especially love the rills in your first and third pictures. I'm the same as you Jennifer. I love to do contemporary designs - the clean geometry is wonderful to work with. But I have to be careful how I interpret that in our more informal, rural location. Even something so simple as edging a patio would work though. What a wonderful post! I'm not sure such a water feature would be appropriate in my garden, but they are beautiful! I've seen them at botanical gardens and they are beautiful. Thanks for all the great information!